Republican Arizona Gov. Jan Brewer quickly rejected a proposal from Sen. Charles Schumer, a New York Democrat, to hold off on enacting Arizona's controversial new immigration law, the Associated Press reports. Schumer reportedly sent a letter to Brewer on Thursday asking her to delay the law, slated to go into effect in July, while Washington works on comprehensive immigration reform. He also asked her to push one of Arizona's two Republican senators, John McCain or Jon Kyl, to support federal immigration reform, in order to give it more momentum. The law in question requires immigrants in Arizona to carry documents verifying their immigration status. It also requires police officers to question a person about his or her immigration status during a "lawful stop" if there is "reasonable suspicion" that person may be in the country illegally. The new measure has outraged Latinos and others across the country who say it would inevitably lead to racial profiling, though the law explicitly prohibits officers from using race or ethnicity to determine "reasonable suspicion." The outrage has led to protests and calls for boycotts of the state. Some Arizona cities have already filed lawsuits against the state challenging the law. Brewer insisted in an op-ed this week that the boycotts in protest of the law are misguided and that Arizona had no choice but to act in the absence of federal reform. 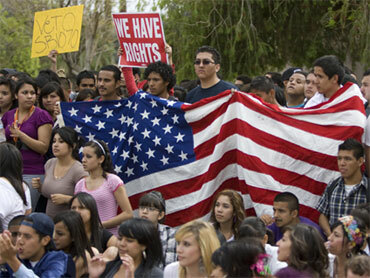 President Obama said earlier this week that Washington should start working on immigration reform this year. While work has already started on reform -- Democrats have put forward a relatively conservative legislative proposal -- White House Press Secretary Robert Gibbs acknowledged yesterday that "there's not enough support to move forward."